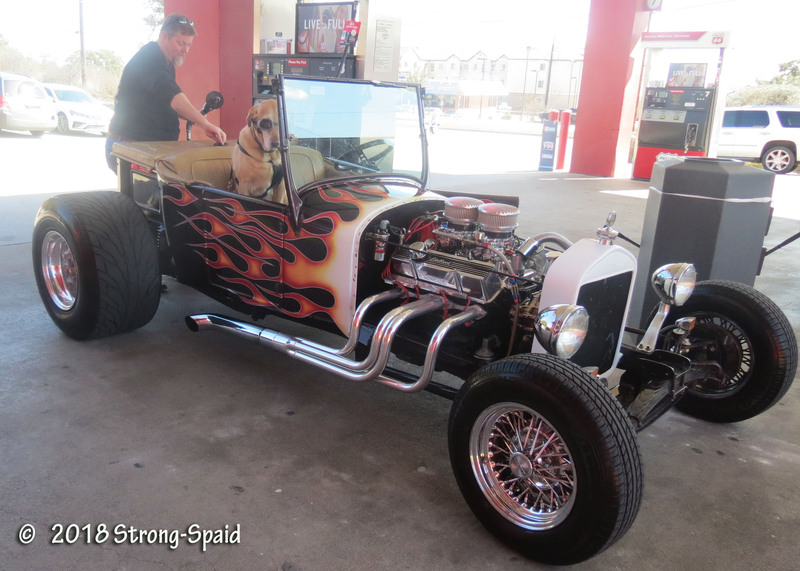 This entry was posted in Animals, Antique Cars, cars, Pets, photography and tagged cats, dogs. Bookmark the permalink. You gave us a good morning smile, when we all needed one. Thanks! Your smile is contagious….made me smile when I read this! It’s so funny how dogs will wear goggles. There’s a motorcyclist out here who’s dog rides in the sidecar with goggles on. When I was in school, I always thought I would be instantly smarter if I could just wear a pair of glasses. Maybe people (and dogs) feel the same way about wearing goggles? Put them on and you are instantly cool! I think that’s true for motorcycle, race car and open cockpit airplane goggles. The steampunk look uses welder’s goggles, so I guess those fit into the cool department, as well. Dogs and cats have a way of creating the lovely unexpected things in our lives, don’t they! Say hi to Mr. Bowie for me…..
Now you made me smile! Thank you! Thank goodness for random happy things that appear in this world…. Thank you! 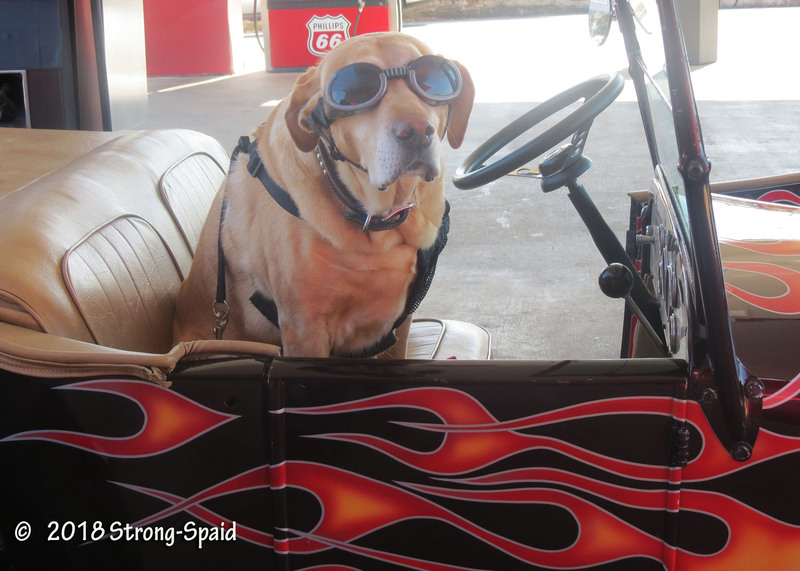 The goggle-wearing dog made my day –so cute! Very cool. Love the photos! Thanks! That day, lots of people stopped to take photos of this unusual sight! How absolutely delightful Mary, thank you for sharing. Labs are really people with fur aren’t they? Wow… Labradors was bred mainly to be a family dog and working dog breed. It is one of the most popular dog breeds both in the United States and United Kingdom. Labrador which is the other name for the dog. It can be a good service dog, watch dog and moreover a family friendly dog. It is one of the most lovable and intelligent dogs in the world. Even though I have never had a Labrador retriever, I know that everything you are saying is true. Every Labrador retriever that I have met….has been incredibly loving and sweet. Showing this post to my boxers, wondering if they might be into goggles. They seem skeptical but I bet they would look so cool. I think dogs are pretty good about trying new things (cats are not). Somewhere I have a photo of a dog wearing a ‘cheese head hat’ and a football jersey….because his owner was a fan of a particular football team. I do not know what that car is, well, other than awesome, but I can tell you that dogs that wear goggles in open vehicles have owners who really care about them! Dogs eyes can dry out terribly in the wind when riding on motorcycles or hanging their head out the window of cars. It can damage their corneas over time. Great post, Mary! I have 2 cats that do NOT even want to get into cars, so I never even thought about dry eye problems that might come from dogs riding in convertibles or hanging their heads out of car windows (with no goggles on)! I will pass the info on to others. Thanks. I read about it once and went out and bought “Doggles” for Tucker. He just loved hanging his head out the window. Miss that little guy. I’ve had Labrador Retrievers most of my life. I don’t find this at all unusual. 🙂 Still, I am not one to accessorize my canine companions. They like simply being in their own coat. I was told that the Labrador did not mind wearing the goggles–for about 20 minutes. AND then, well, it is time to take them off! Cats usually like a nice safe routine that they can count on! Nice car and a beautiful dog! My guess is that the car was assembled from a kit and from various parts from who knows where. Yes. The dog didn’t seem to mind at all. 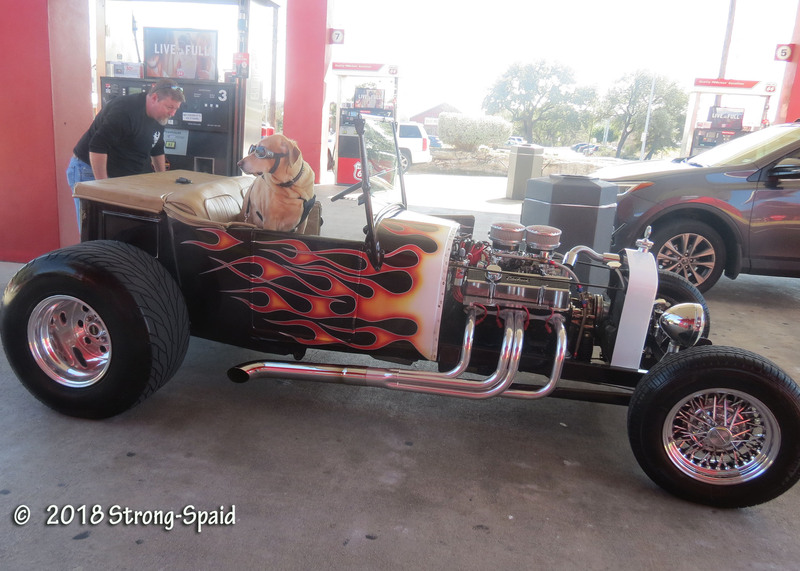 The dog’s cool but I love that hot rod! Based on a model T Ford I think. Years ago when we had a cat and had to take it to the boarding home when we went on holiday, it would stand on my lap with it’s paws on the steering wheel! You should have seen the looks we got! That was a rare cat!